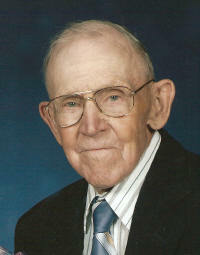 Leo B. Korte, 96, of Breese, died Friday, February 20, 2009 at Aviston Countryside Manor. Mr. Korte was born May 5, 1912 in Breese, a son of Conrad and Mary (Steinman) Korte; they preceded him in death. He married Adelle Woltering on November 27, 1947 at St. Francis Catholic Church in Aviston; she preceded him in death on August 26, 2006. In addition to his wife he was preceded in death by a son-in-law, Wynn Frost; brothers, Alvin Korte and Eugene Korte; a sister, Marcella Rascher; sisters-in-law, Edna Korte, Sr. Lucille Woltering, ASC, Sr. Collette Woltering, ASC, Marie Moss, Josephine Woltering, and Alice Woltering; brothers-in-law, Herman Woltering, Edward Woltering, Joseph Woltering, John Moss, Vincent Thien, and Bob Ritchey. Leo is survived by his children Mary (Peter) Bondioli of Herrin, Jerry (Judy) Korte of Breese, Jim (Julie) Korte of Chatham, and Nancy (Floyd) Loss of Salem. 10 Grandchildren-Kevin (Jennifer) Frost, Sara Bondioli, Patrick (Colleen) Kampwerth, Valerie Korte, Matthew and Michael Korte, Jason, Jeff, Joe (Ashley), and Jenny Loss. 4 Great-Grandchildren-Tess and Tori Kampwerth, Sophie Loss, and Nolen Frost. A brother-in-law, Al Rascher of Breese and a sister-in-law, Veronica Ritchey of Branford, FL. Leo retired from the farm where he lived his entire life. He was a member of St. Augustine Church and Men’s Sodality, Breese Knights of Columbus Council 2869, Clinton County Farm Bureau, and the Breese Senior Citizens. Funeral Mass of Christian Burial will be Tuesday, February 24, 2009 at 10:00 AM at St. Augustine Catholic Church with Rev. Joseph Rascher, Rev. Chuck Tuttle and Deacon Bob Lippert celebrating. Interment will follow in St. Dominic/St. Augustine Cemetery, Breese. Visitation will be Monday, February 23, 2009 from 4:00-8:00 PM and again on Tuesday, February 24, 2009 from 8:00-9:45 AM at the Moss Funeral Home in Breese. Memorials can be made to Mater Dei High School or All Saints Academy and will be received at the funeral home.